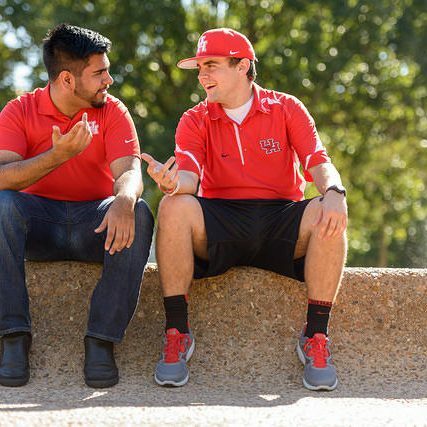 The University of Houston has many traditions, some time-honored and some relatively new. Here are some facts you may know, and some you may not, about our unique rituals. 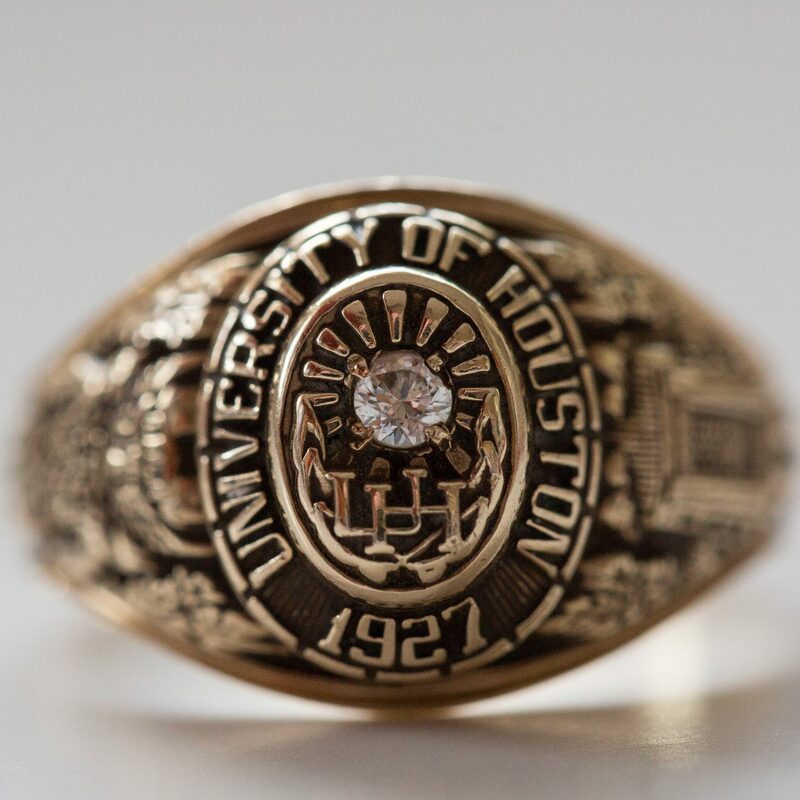 So many University of Houston traditions reside in the hearts of students and alumni, but the UH class ring is the only tradition that is always with you. The ring is presented each semester at a formal ring ceremony. Tradition dictates that current students must wear the ring facing inward, with only alumni wearing the ring facing outward. Students and alumni receive their class ring at the Ring Ceremony, an event held prior to both the December and May graduations. Each class ring spends the night before the Ring Ceremony with our live mascot, Shasta VI, in the cougar habitat at the Houston Zoo. The mascot of the University has been a Cougar since 1927. The mascot was selected by our then Professor John W. Bender. Coach Bender joined the faculty after having served as the Head Football Coach at Washington State University. During his tenure at Washington State, he became fond of the WSU mascot (a cougar). When he arrived here, the students were looking for a name for the student newspapers (the school’s first extracurricular activity). He suggested that they call the newspaper the Cougar because of the grace, power and pride that the Cougar embodies. The name was unanimously agreed upon. 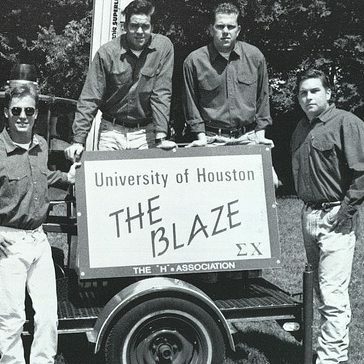 From that time on all University of Houston student groups and activities have been associated with Cougars. We may well be the only university in the USA to name its athletic teams after the student newpaper. Shasta is the name of the very first cougar that ever represented the University of Houston. The name was chosen from the Alpha Phi Omega’s “Name the Mascot” competition in the Daily Cougar. The winning entry was from then student Joe Randol. 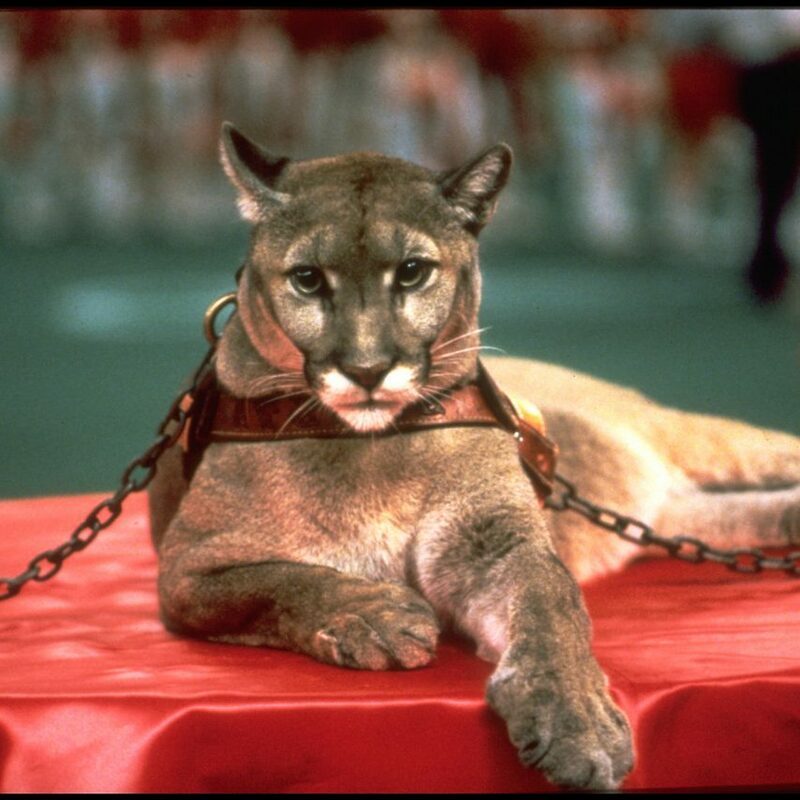 However, after the death of Shasta V in 1989, the university has not purchased another live cougar. There has been continuous debate & various attempts to resume the tradition, but none of the attempts has proven succesful. So, the debates rage on. Today, Shasta has morphed into a costumed student, but still maintains the spirit of the Coogs. Shasta has been joined by a new “female” costumed mascot named Sasha. Many of the alumni were perplexed by this as Shasta was also female…. Frontier Fiesta was founded in 1939 as a student-run festival and was dubbed “The Greatest College Show on Earth” by LIFE magazine in 1958. After being discontinued for over more than 30 years, Frontier Fiesta re-started in 1991 and continues to be a completely student-run event featuring variety shows, free live concerts, carnival booths and a barbecue cook-off. 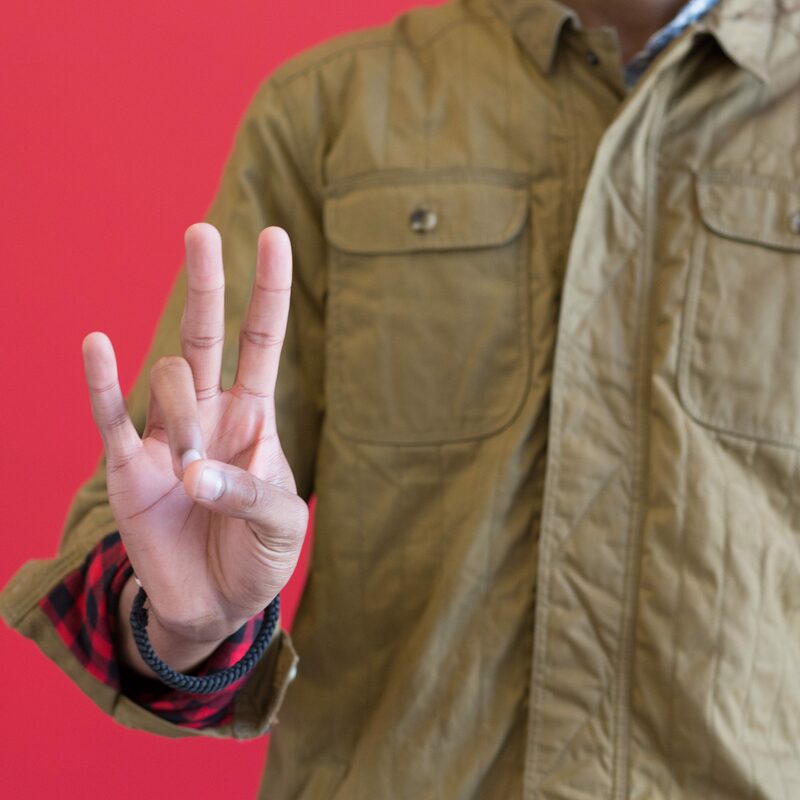 In Texas, all of the major universities have adopted a hand sign which signifies to all other Texans where your loyalties lie. The Cougar Hand Sign is no different. Although the original hand sign was the “V” for Victory until 1965, events conspired and a new hand sign was adopted. The inaugural football game between University of Houston and University of Texas during the 1953 campaign witnessed the birth of a blood rivalry between the state’s two largest universities at that time. However, it also led to the adoption of another Cougar Hand Sign. During her transport from Houston to Austin, one of the fingers on Shasta’s paw was severed when the cage door was closed. As the University of Texas partisans and players caught wind of the accident, they mimicked the animal by bending their thumb over the ring finger against their palm. This gesture implied that the Cougars were invalids. The Cougars would go on to lose the game 28-7. The cougar faithful, still mindful of the stinging defeat suffered 15 years earlier, never forgot the taunting that they received. The next time the two teams faced off (1968… a whole 15 years later), UH tied UT 20-20. At that point, the students thought there might be a bit of magic in that sign, and the hand sign was adopted replacing the “V”. In 1976, the Cougars first football season in the Southwest Conference, the Coogs & Horns met for the third time ever. The Coogs put a beating on the Longhorns that they have yet to forget 30-0 (a.k.a.the “Dad’s Day Massacre”) in front of the largest crowd to assemble in Memorial Stadium at that time. That victory ended the Longhorns famed winning streak, and the embarrassment also signaled the end of legendary UT Coach Darryl K. Royal’s career. After that victory, the Cougar Hand Sign became firmly entrenched. Important Note: Only one hand is to be held aloft when making the Cougar Hand Sign. 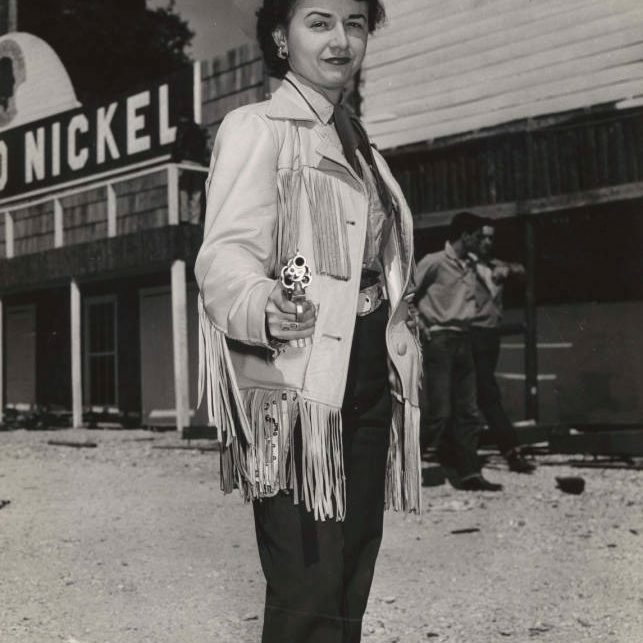 The Frontiersmen were established in 1948 as a result of a concentrated effort to promote more school spirit within the student body. The primary purpose was to support the University of Houston in any and all endeavors. This included support for the athletic department, Frontier Fiesta and academic success of the University. The original Frontiersmen were among the most dedicated and loyal students at the time. After many years of Frontiersmen history and service to the University, the Frontiersmen tradition lay dormant for quite some time. This tradition was officially revived in 1992. 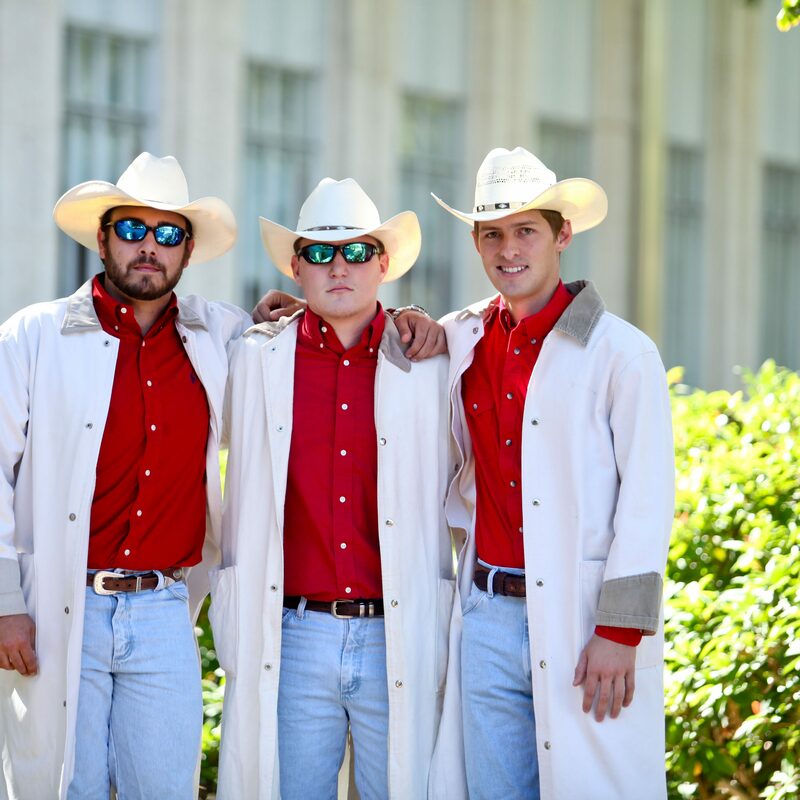 In the spring of 1993, the first Wranglers were installed into the Order and dusters were added to the attire. Until then, the Frontiersmen wore the attire similar to the original members. In the fall of 1994, the Frontiersmen began running the UH Flag across the field after each score at football games. In 1996, the Frontiersmen displayed the Texas Flag as well as the University of Houston flag at football games as a form of respect and obligation as the lone representative of the State of Texas in the newly formed Conference USA. The tradition has continued although other Texas Universities have joined Conference USA in recent years. Head Football Coach Jack Pardee, Heisman Trophy Winning Quarterback Andre Ware and former Quarterback David Dacus felt the University lacked a symbol for the football team. An oil field siren was chosen to represent the University’s ties to the petroleum industry and the “air-raid” style of offense at the time. A group of students, all members of Sigma Chi Fraternity, manned a manual crank siren that sounded after each score. In the summer of 1991, David Carl Blazek, a staunch supporter of the University and member of Sigma Chi Fraternity, passed away. His death was a blow to the original men who ran the siren. They named the siren “The Blaze” in honor of their fallen brother. In the of Fall 1991, through the efforts of the “H” Association, the Taxi Squad, Pleas Doyle and the Hruska Family, the purchase of a new siren was complete. However, the siren did not arrive until the day before Homecoming. To this day, every time that The Blaze is sounded, the University hears the voice of David Carl Blazek. While the Run ‘n Shoot/Multiple Adjusting Passing System Offenses were in use during the Pardee & Jenkins years, no mascot did more pushups than Shasta. Beginning in 1987, the pushup tradition was started, with the mascot doing over 1,400 in the first year. 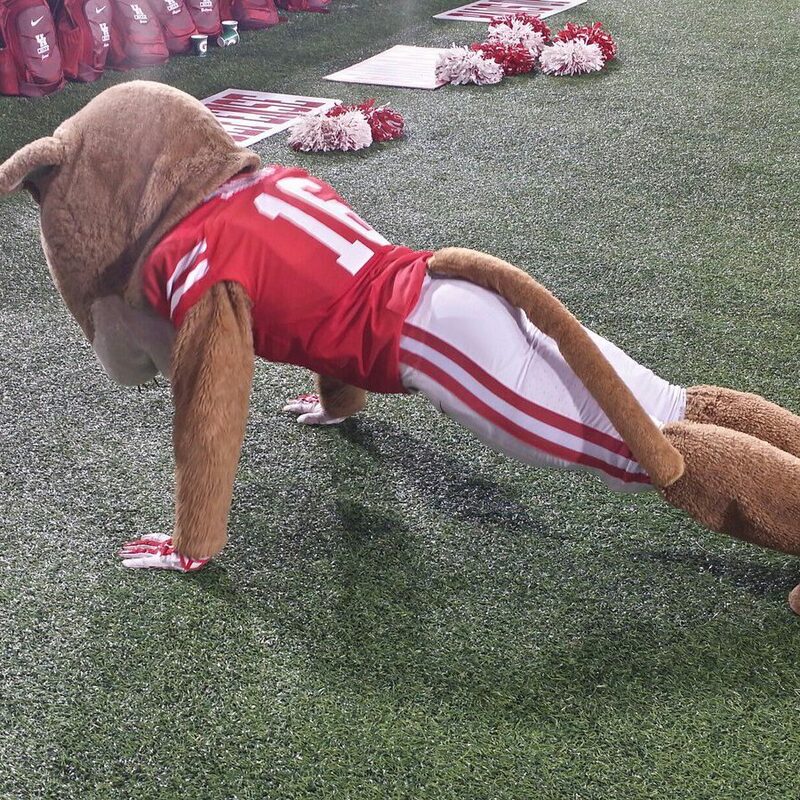 During the infamous 95-21 victory against SMU, Shasta did over 800 pushups. At the time the pushup tradition began at UH in ‘87, only Clemson University and the service academies were doing it. Now it is very commonplace across the country. Nevertheless, it is a cherished rite at UH Football Games. Wearing red on Friday is more than just a tradition; it is who we are. We wear red to show our pride and passion for the University. It is our visual identity. The color unites us, to live and to celebrate together, and behold our individual achievements as a singular legacy of the pride. We encourage our campus community and those all around the city to wear Red on Fridays.The UH campus community, alumni and the city of Houston are all encouraged to wear red on Friday to show pride and passion for the University. 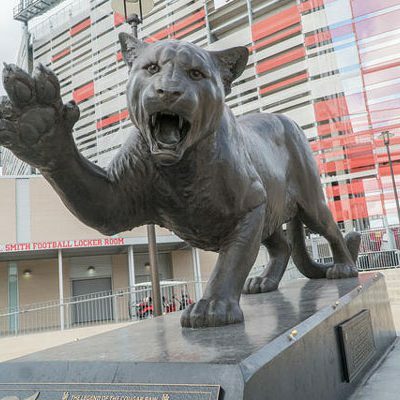 In honor of UH’s first live cougar mascot, Shasta I, a statue was installed at Gate 2 of TDECU Stadium that tells the story of the Cougar Hand sign and its genesis. Cougar fans rub her extended right paw for good luck prior to entering the stadium on game day. Cougar Fans also “rub the paws” of the cougar statues in Cullen Family Plaza, in front of the E. Cullen Building. It’s especially important during Homecoming. Sometimes students rub the paws for extra luck on their final exams, too. In the early 1970’s, a new spirit tradition was introduced at UH football games. A golf cart was retrofitted with a fiberglass football helmet and painted with the scarlet and white UH logo. After each UH touchdown, the buggy was driven around the stadium. In addition, four female students chosen by the administrative and coaching staffs rode on the buggy and engaged with Cougar fans during the celebration. 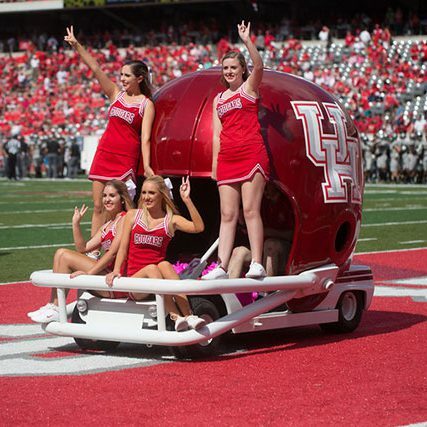 The tradition continues to this day with the Buggy Beauties serving as spirit ambassadors for UH year-round. Fans can line up to take part in the Cougar Walk two hours before kickoff. 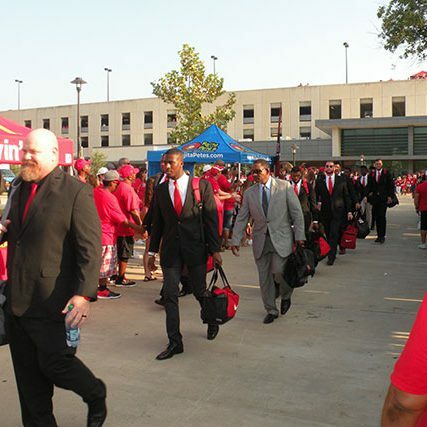 Led by the head coach and accompanied by the Spirit of Houston, the team is dropped off on Cullen Boulevard as they make their way past the UHAA Party on the Plaza and Shasta Square Student Tailgate into the locker room. The official University of Houston Alma Mater was the culmination of an assignment by Associate Professor of Music, Bruce Spencer King. He assigned his harmony class the task of composing a song that was suitable to become the University’s Alma Mater. The 18-year old Irwin T. Andrews wrote a violin melody, which was then expanded by Prof. King into a four-part harmony. The entire class hammered out the lyrics while King arranged the chorus. After an interminable amount of begging, the song was sung at the 1942 commencement. The song has been a part of the University lore from that day on. The most popular version is by former students Forest Fountain (lyrics) & Marion Ford (music). It is the Cougar Fight Song currently played by the band at all contests and events. A local musician, Ed Gerlach, and his orchestra popularized the current version of the Cougar Fight Song in the 1950’s. However, the school also had another Cougar Fight Song composed by John Perry (a UH accounting student who contracted polio during his collegiate days). This, the original Cougar Fight Song, was introduced during what is considered the first “big-time” football game for the University of Houston: a 1949 contest with then national powerhouse College of William & Mary. Likewise, legendary band director Dr. William C. Moffit also contributed songs which have become de facto UH Fight Songs: Eat ‘Em Up & Touchdown. Fight for Houston University for victory is near. We never worry ’cause we got the stuff.